Google AdWords is a very potent element of Search Engine Advertising (SEA) within an online marketing campaign. Your advertisements are specifically positioned in in the search results of search engines. Payment is calculated based on the 'per-click' system. You only pay for the number of clicks achieved by your advert. With Google AdWords you can effectively purchase a leading position in Google’s Search results for a period of time. However, positioning dies not only depend on the price paid by the customer. The composition of the advertisement is also being evaluated. 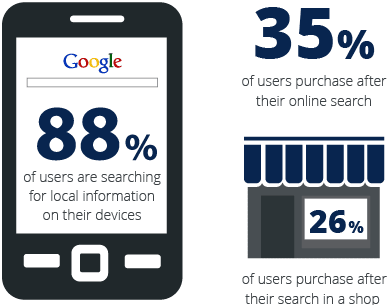 Smartphone owners don’t exclusively search on their smartphones. Most people use the most practical device, depending on the situation. That may be the PC at the office or the tablet in bed. It is therefore paramount that websites work equally well on all types of screens. 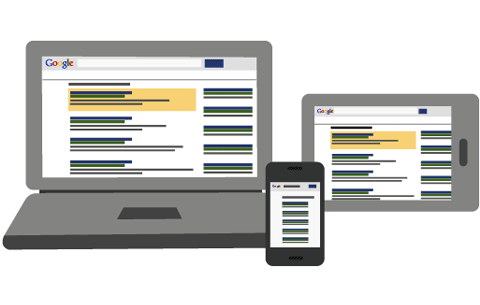 Please check www.google.com/think/multiscreen for tips on how to make your website mobile ready and for success stories. The propagation of Smartphones has been increasing by 11% year on year since 2011. In 2013, the share of Smartphones in Germany was 40%, demonstrating that Smartphones have become an important part of life. They change user behaviour and increasingly influence purchase decisions. As Smartphones, Tablets & Co were amongst the top Christmas gifts in 2013, this growth trend is expected to continue in 2014. Therefore, adjust your advert to ensure its appeal to mobile users. Google continuously offers new advances in Search Engine Advertising. New opportunities for presenting Google AdWords in search result listings and also on Google Partner Platforms are offered at regular intervals. Apart from the usual text advertisements, there are many additional formats for running a Google AdWords campaign. Examples are advertising on YouTube or ReMarketing advertising. Users, who already visited your website, will be presented with your adverts on other internet sites. As mentioned before, quality is a paramount criterion in the positioning of your Google AdWords. This underlines the importance of engaging a professional agency for the design and management of your Online Marketing Campaign. We provide you with continuous support, quality control and professional optimization.